The oldest of the great nieces and nephews turns 5 today. It doesn't seem possible. 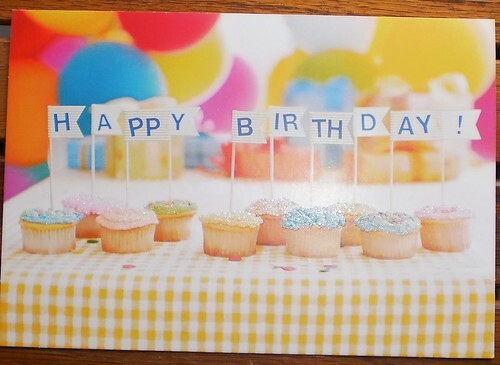 In my trip to the grocery on Thursday, I looked for a card, a simple, "Happy 5th Birthday" card. It didn't get in the mail on Friday because, when you're sick, the simple act of sending a card becomes a series of steps that becomes too much to contemplate. Remember your niece is married so she's going to be in the book under her MARRIED name. Affix stamps and stickers to the card. So, you see, it's not an easy thing to "drop a card in the mail". By the time I managed to get all of this done, it was well beyond the time I could have gotten the card in my mailbox for pick up. It will be mailed on Monday. It all starts with the right card and I nearly gave up at that stage. I'm standing in the card aisle at the grocery. I don't expect there to be the selection I have at a Hallmark store, far from it. But I was very dismayed by what was there. I want just a simple birthday card, maybe something with stylized flowers, or a dog or a cat or a big cake or an oversize 5, just something simple. What do I get to choose from? Cards with these faces plastered all over them. The sentiments all revolved around "Happy birthday Princess". Now, it can be argued that, at age 5, a child is a bit young to understand the connotations associated with the word 'princess'. But, sorry Hallmark, that is not the message I wish to send to my great-niece. 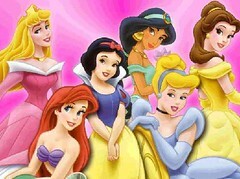 Disney-fied princesses are not the kind of role models young girls should embrace. There's a whole 'damsel in distress' theme for most of these and they are only whole when 'rescued' by a prince. At this age, separating reality from fiction is hard. I don't want to contribute to any muddying of the waters. Do I think she's a 'princess'? If, by 'princess' you mean a very special girl, yes, yes she is. If by 'princess', you mean a person entitled to special treatment who ultimately defines herself by the guy she lands, then no, absolutely not. She's allowed to dress up, to play in imagination. I strongly encourage it. Imaginative play encourages dreaming and having dreams gives rise to setting goals and, well, maybe that 5 year-old in the Snow White costume will discover a cure for cancer. But it really bothered me that the choices I had for a birthday card were all about being a 'princess'. Can't they be about being a kid?